Review by Kathy Kuhl Is college a possibility for students with learning disabilities? If so, how do parents help them pass the college entrance exams like the SAT and the ACT? How can teens who struggled to read or focus get the accommodations they need in college to develop their gifts? While homeschooling several struggling learners, Hal and Melanie Young found themselves helping these sons prepare for college exams and college life. Their new book, Help is on the Way: A Homeschooler’s Guide to Accommodations for the SAT, ACT, and College, is worth your time. These parents, speakers, and veteran homeschoolers provide a short practical guide to getting the documentation parents need to submit. Better yet, they show how to present it so your teens may get needed services during the exams and in college. If you aren’t familiar with accommodations, they are services provided to students with special needs, to give them a fair shot. For instance, large print is helpful for dyslexics and for students with vision impairments. For a student with attention problems, taking the exam in a smaller, quieter room with fewer students can help avoid the distractions of a typical exam room. Some students qualify for extra time. If students have ability, but also have a disability, these accommodations make it easier for college to get a true sense of this student’s potential. Next, the Youngs turn to the college entrance exams, the SAT, the ACT, and the new CLT. Describing the differences, they also tell what accommodations are available with each exam. Again, the resource section provides many links to the sites you need to help you navigate this process, and an ideal timeline for working your way. The SAT, ACT, and other exams are given in public high schools and some private schools. Each school will have a designated testing coordinator. You’ll have to deal with this person directly. In a particularly helpful section, the Youngs explain what to do when that person is difficult. Perhaps he or she says your student cannot take the SAT or ACT! There are effective ways to overcome such obstacles. In the next sections, Hal and Melanie Young describe the college application process. Next, they turn to how to learn what accommodations are available at different college and universities. Helpfully, the Youngs cover what do to when professors and institutions make it hard for your students to get the services they qualified to receive. The Youngs’ sons experience matches what I’ve learned with my son and heard from others. Some professors don’t have a clue or are downright difficult toward students with learning disabilities. The authors tell ways to avoid these faculty members, and ways to work around them. The Youngs also discuss scholarships and other ways to make college more affordable. In conclusion, they address dealing with the transition to college life, and provide twenty pages of resources, sample letters, sample plans, and that useful timeline. Finally, Hal and Melanie Young have created another readable, helpful book. I recommend you buy this book if you think your teen might be college bound, or if you’re sure of it. 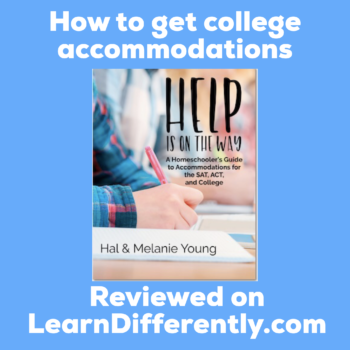 You’ll find Hal and Melanie Young’s book, Help is on the Way: A Homeschooler’s Guide to Accommodations for the SAT, ACT, and College here. What resources help you equip your child for college success? Please answer in the comments below. Thank you. My blog series on getting accommodations in college begins here. Another blog post What about high school credits, diplomas, and transcripts? I reviewed Self-Advocacy Skills for Students with Learning Disabilities: Making it Happen in College and Beyond, by Henry B Reiff, Ph.D.
My review of Why Freshmen Fail And How to Avoid It, by Carol Reynolds, Ph.D. This old post contains outdated material on getting accommodations, but I include it because it provides great examples of the importance of getting the right wording, and of knowing what to ask for. So glad people are addressing this! We are blessed to have access to a Christian School Psychologist who also works with homeschoolers and has helped us through this process. But while I think the homeschool community as a whole has done well in equipping parents to teach kids with learning disabilities or who are “twice exceptional,” as a group we drop the ball regarding educating parents in how to get appropriate diagnoses, documentation, and accommodations for education after high school. My college-age engineering student with ADD and dysgraphia receives testing with time and a half at his college testing center, and keyboard use for essays. He got those for the ACT, too.